Good afternoon and welcome to Week 8. This week we get back into persuasive writing and are writing our own text on a topic of our choice. This is an opportunity to practice what we have been learning before we complete a hot task independently to show what we have learned. In Maths, we are learning about fractions and in Science we have been exploring why there are the phases of the moon . I will hold interviews during Monday to Thursday of week 9. I have placed an interview schedule on the class room door. Please place your name against an allotted time. Harmony Day. March 29th 2019. 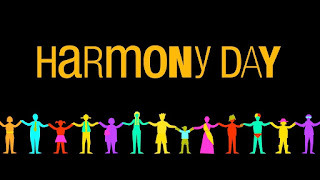 Dear Parents, We need you….. On the 29th of March the students of Our Lady of the Cape Primary School will celebrate Harmony Day. Good afternoon Year 3Mc Parents and welcome to this this very important week in our faith journey. Arrival Time & Dress - Please be at the Church by 5.20pm. Your child is to be dressed in smart casual clothing. Upon arrival they will show you to your seat. Please be mindful that some of the pews are quite small so it will be for immediate family only (parents/siblings). There will be room in the choir loft for additional family members. All students have a part to play in the service so please ensure they are seated in the Church by 5:20pm to enable them to prepare themselves for their part in the service. Prayer Buddies - All prayer buddies are expected to attend...please let me know via email if you are unable to attend. Rehearsals - We will be walking down to the Church on Tuesday from 11.30. This will help the students to feel confident in their preparations so they know what to expect.